Trigger warning: This article will discuss the particulars of the death of an animal in detail that may be uncomfortable for the reader, including the cleaning of bones and the process of removing the body from the home. Please be advised. After listing the types of familiars and distinguished the domestic familiar from an ordinary pet, we dove deep into the world of familiarship, from the pact and the ways your familiar will offer to help you to what you can offer in return. We've talked about the familiar in the context of ritual and answered the question of whether you can have more than one domestic familiar. As we draw to the close of the series, we must talk about endings. Today's ending involves the passing of the domestic familiar across the veil and into the Other. Previously, I've mentioned that domestic familiars gain their abilities by having one foot in the Other. One of the reasons for that is their transient life. As much as it may pain us, our familiar will eventually pass. That's something we must be prepared for mentally, physically and financially. The ability to communicate with your familiar is key in this situation and their choices should be written into your pact. Before doing just that, here are some tips to help guide you through your familiar's end-of-life stage. How will your familiar pass? The first question you should answer is how your familiar wants to go: Naturally or via euthanasia. I have yet to have a domestic familiar choose a natural death but I'm certain some will want to pass that way. My domestics have all agreed that euthanasia will help lessen the pain and, as such, make their passing easier. Keep in mind that natural deaths will require some kind of palliative care, including the possible administering of pain killers or fluids via syringe or even needle. Becoming your animal's full time hospice nurse may not be an option for you depending on your lifestyle or concerns, and thus you may need to insist on euthanasia. You'll also want to determine when the familiar can no longer make a decision for themselves and when you must take control. A clause should be written into the pact that, if the familiar is experiencing prolonged suffering or the spirit is refusing to detach from a withered body, euthanasia be utilized as a method for releasing your familiar from their physical prison. Once it becomes cruel to keep them living, you must, as a living being, make those kinds of hard decisions. Where will your familiar pass? While the method of passing will likely determine the location, it's something to clarify long before the time comes. Natural deaths will most assuredly happen at home. Euthanasia, however, has some options. When most think of pet euthanasia, they think of the vet clinic. That's certainly an option and one we personally have utilized. There's nothing wrong with that if that's what's most comfortable and financially feasible for you and your domestic. However, if the vet feels too cold, mobile vets offer in-home or at-park euthanasia. This gives you a wide variety of options to control how the end-of-life stage occurs. Who will be present at your familiar's death? Will it be just you? Your immediate family? Friends or covenmates? 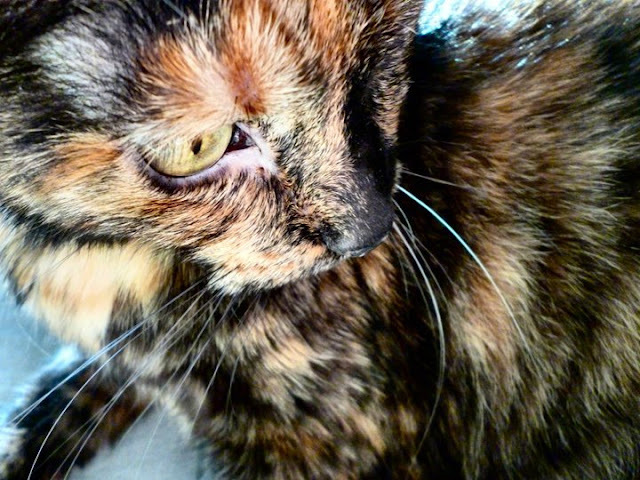 These factors may also change the location of your familiar's passing. For one of my familiars, he's requesting the coven be present. If the coven is present, his passing has to be in the home because the number of people will not fit into a vet office. As you make this decision, you and your familiar should keep in mind what you are both comfortable with. You may want your friends around but your familiar may panic, causing a disruption to their end-of-life experience. Your familiar may want your coven there but, if your coven cannot handle their grief, it may put extra responsibility and weight on you in the process. What to do with the body. You and your domestic should agree on what to do with their body once they have passed. This should definitely be planned prior to their death. Once passed, they may emit bodily fluids and, after 4-6 hours, will begin to smell. If you need to store your familiar after their passing, wrap them in a blanket, then utilize a plastic bag or two. You would preferably freeze or refrigerate them until the next step but, if that's not possible, you may need to move them to a part of the house where smell and mess are less likely to be an issue, like a garage or laundry room. The smell will eventually permeate your house and you will need to make the next move as quickly as possible. Preferably, you will immediately begin the next step of the process once they have passed. You have a few options here: Burial, scavenging, cremation and taxidermy. For burial, you will want to keep the laws of your area in mind. Some cities, counties and locales do not allow for the burial of animals. Look up your local laws to be sure. If they do, you will want to remove any item that is not bio-degradable and place them in a cardboard or wooden box. If you wish, you might leave with them any items that they were particularly attached to in life. Be sure to bury the body at least 3 feet down to avoid scavenging animals from digging them back up, especially since this may be traumatic. For scavenging, you may find it best to leave your familiar's body in a secluded area, preferably on private land where you've obtained permission to do so. In this scenario, other animals and bugs may feed on them. Again, be sure to check with local laws to ensure this is legal. Also, ensure wildlife safety. If your familiar is heavily medicated or has passable disease, this is absolutely not an option for you. Those medications or the disease could hurt local wildlife. If you'd like to cremate your familiar's body, you can speak with your vet to find places that will do so. Cremation is a clean and safe way to dispose of the body while still retaining their ashes. Taxidermy is your final option. Keep in mind that this can be expensive and your familiar may not look the same as you remember them in life. That being said, if this is a viable and wanted option for you, you will need to have a place ready and willing to take your familiar's body post-death, or a means to store it until they can do so. Utilizing parts of your familiar's once-living vessel. After your familiar's death, you may have agreed to utilize pieces of your familiar's body, such as fur clippings, claws, teeth, paw prints or more. Now would be the time to obtain these before your familiar's body is laid to rest. If you've chosen burying or scavenging the body, you may want to return for fur and bone pieces. Burial or ants are the most effective way to begin the cleaning process for bones. Depending on your climate, season and local ecosystem, full decomposition may take between a few weeks to a few months. Don't be shocked if some pieces are missing. To avoid this, you'll need to cage the area off so that scavenging animals can't take bones on their own. Next, you'll want to gently clean the bones using warm water and a soft brush or toothbrush to dislodge any dirt or remaining fur. Always wear gloves and a face mask when handling the bones prior to their complete cleaning. This includes gathering from the site and the entire cleaning process. You'll need to decide if you need to macerate the bones. Maceration is the process of removing the remaining skin, flesh and fur with water. One such way to do this is to fill a bin with water, place the bones inside and cover it, occasionally draining the water and replacing it as needed until the bones are clean of decomposing material. This bin should preferably be stored outside, though that may not be possible if the temperature is at or below freezing. Unfortunately, storing it inside will create a permeable smell that will make you sick. If you cannot macerate because of the temperatures, I would suggest storing it in a bin that you can seal until the freezing temperatures have ended, then moving forward with the maceration process. This process may take anywhere from a few more weeks to a few more months. Once fully macerated, you'll want to remove the grease associated with bodily fat by soaking the bones in a mixture of water and dish soap sealed in a tub, occasionally replacing the soapy water until no more fat surfaces. You'll then rinse and move the bones to a tub of 50% water, 50% hydrogen peroxide, which will whiten and sanitize the bones. This process may also take a week or so and you will need to, once again, replace the water as it soils. Keep in mind that cleaning and sanitizing bones is not a quick, easy or scentless process. You will need the proper utensils to do it and enough space and outside storage that the smell won't infect your home. If this isn't possible, you might look into a taxidermist who can offer the same services. A taxidermist can also create a full taxidermied version of your familiar if that's something you want. If you want to cremate, don't fear: Ashes can be added to your Craft. It's sanitary and incredibly useful in a variety of ways after your familiar's passing. A new vessel for your familiar. Now that the prior vessel has been resolved, you and your familiar will need to decide if they want a vessel or home for their spirit. Vessels take many forms, from a taxidermied body to a stuffed animal, a statuette to a jar and more. Familiars can be tied to jewelry, clothing, boxes, utensils - just about anything you can think of. In order to tie the familiar's spirit to the potential vessel, the first piece you'll need is a taglock. Earlier, I suggested gathering any teeth, claws, fur clippings, bones and/or ashes needed from your familiar's remains? These are taglocks and, if you and your familiar need to connect after their passing, this is the key to doing so. Whatever vessel you choose, you'll want something that you can either place the taglock inside of or bind to the outside of it. Other additions to a vessel that may assist in connection include graveyard dirt from their place of burial or scavenge, eggshell or bone dust created into chalk for sigils and flowers of the dead, such as dandelion and lily. A note of caution: Lily is poisonous to most animals, so if you still have other animals in the house, you'll want the lily sealed and away from their ability to consume it. You can also add things your familiar liked in life, such as seeds, dried catnip, toys, wood and so forth. Because your familiar is pacted with you, you may be interested in adding some of your own taglocks, including nail clippings, hair, blood, spit, etc. Stuffed vessels can be resealed with thread or handmade. Jar and bottle vessels will need to be sealed with wax, glue and/or yarn. If your statuette is hollow, seal it with cork and glue. You want to ensure the contents will never exit from the vessel. Of course, you may need to construct a ritual to officially tie your familiar with its new vessel. It is entirely possible that your familiar will reject that vessel and suggest improvements. You should work with your familiar prior to its passing to ensure potential vessels are built properly and, after their passing, listen attentively for corrections and changes. You two should also work together to form the connection ritual. Perhaps, however, your familiar is more interested in being a part-time resident rather than a full-time grounded spirit. Spirit houses are a great way to help them have a little rental home of their own. Spirit houses are typically made of jars in a similar fashion to spirit vessel jars but you do not seal the cork. Spirit houses can also be made in decorative boxes, bird houses, doll houses or just about anything you can think of. You can paint and decorate them to attract your familiar in and leave items and offerings inside to help them feel at home in their new space. Whatever you decide, it needs to be a join decision between you and your domestic. 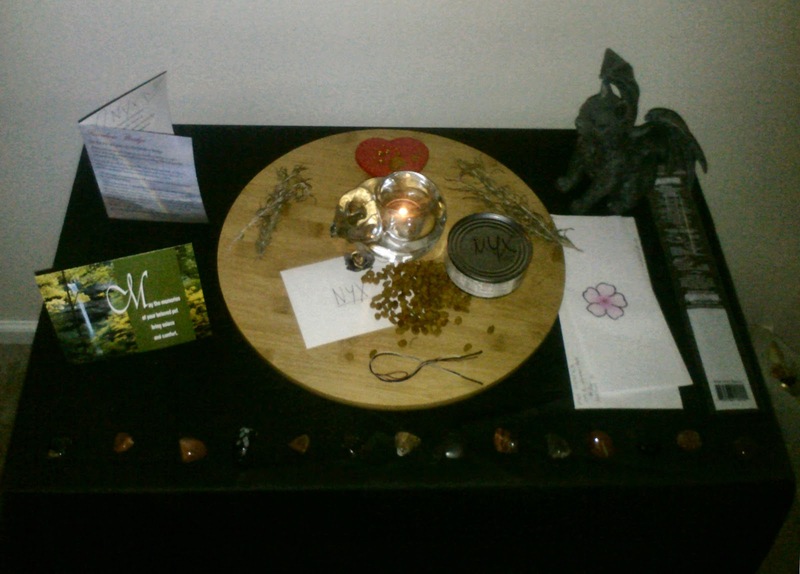 Creating an altar to passed familiar. Whether you decide on a vessel, a house or nothing at all, your familiar may want an altar erected in their honor. This can also help tie them to the physical world and improve communication between you two. Aside from a vessel or spirit house, your altar should contain anything that honors your domestic companion. Above, you can see the altar I created to my passed familiar, Nyx. 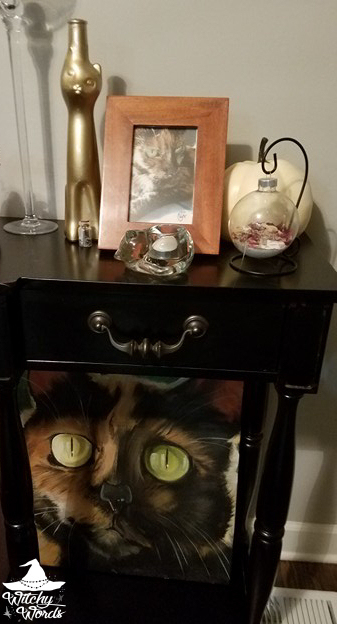 I included her paw print plaque, a candle in a cat-shaped candle holder, her favorite food, rosemary for remembrance, a knotted remembrance cord, stones that reminded me of her and any and all cards and gifts I received in the wake of her passing. An altar like this one can give you an opportunity to leave offerings and notes of communication until your bond can strengthen with your familiar. You and your familiar will need to decide if the altar will be temporary or permanent. Will you erect an altar in the wake of their death until a certain amount of time has passed? Will the altar be a part of the ritual you create to tie their spirit to a vessel or spirit house? Will you take down that altar once the ritual is complete and create a new one in their honor or will the vessel or spirit house be enough? Do they want an altar at all? These are all questions to ask your familiar as you pact and throughout your familiarship. Nyx never did want a vessel or statuette. The painting I did of her was created while she was alive and merely a tribute. Her altar is all that was needed. From domestic familiar to spirit familiar. The transition between domestic familiar and spirit familiar can be startling. You may find that, initially, you won't be able to feel, hear or see your familiar's spirit. This can be devastating. Don't panic. Your familiar has slipped through the veil to the Other and it may take them a while to realize they have died and to find you again. Creating altars, making offerings and putting together a vessel and/or spirit house all can help your familiar's spirit return to you. Your familiar may want to explore or visit other people, places and spirits. Give them time to do so. The fact that the familiar wouldn't immediately be there post-death was a shock to my system with Nyx. 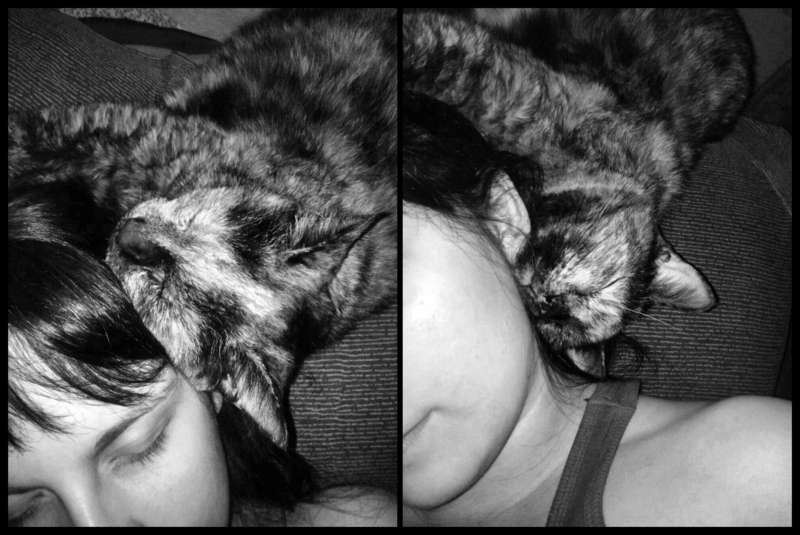 As I napped next to her body in grief, I expected to feel her, see her, find her shadow out of the corner of my eye. I didn't for weeks. 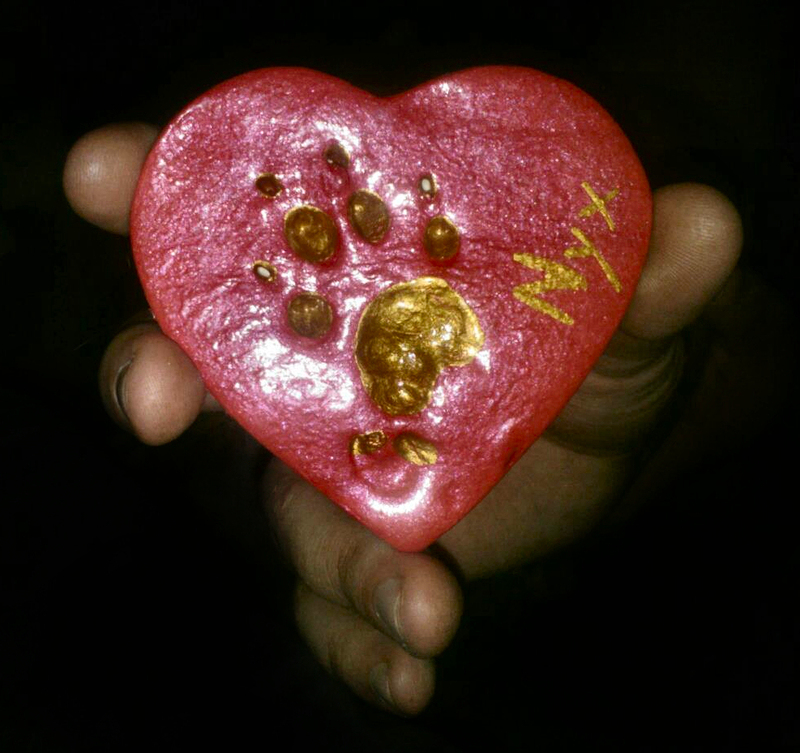 It wasn't until I received her paw print plaque in the mail nearly a month later that she came back to me. It took that taglock to help her find me again. You also may find that you struggle to communicate at first. It seems strange given that the familiar's voice has always been a sort of astral projection of its own. You would think the spirit voice would be no different. However, when your familiar was present on the physical plane as you are, it made communication easier. You're now trying to cross planes as you speak. This can create almost a language barrier of sorts as you attempt to reconnect. 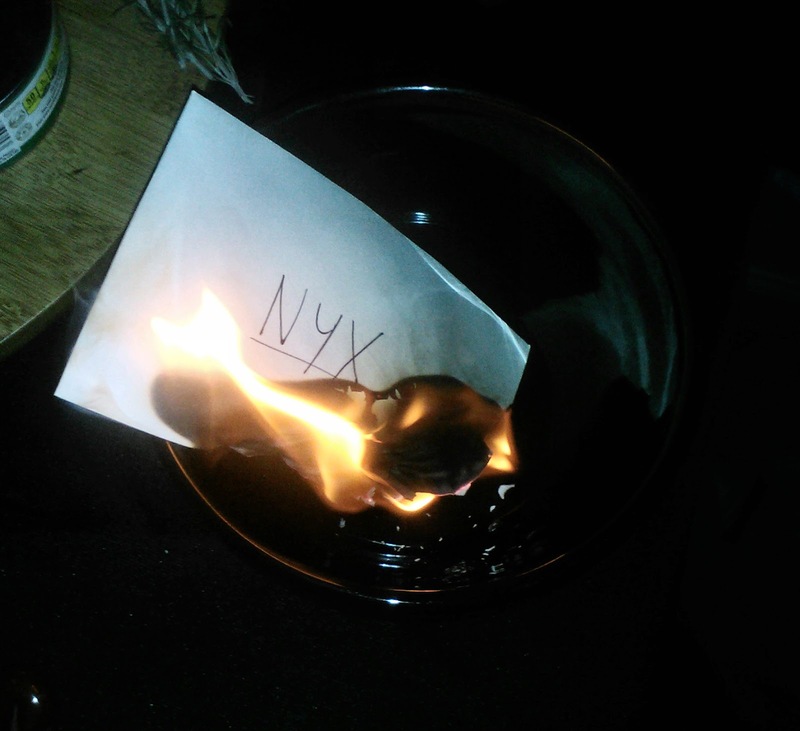 Until Nyx and I could fully communicate, I wrote her letters and burned them on her altar. I left her offerings of food in front of her paw print plaque and lit the candle on a regular basis in hopes she could connect for clearer communication. Eventually, with much work on both of our parts, we found our voices once again. In terms of the familiarship as it once was, the only thing that should change is the lack of a physical form. All the same help a domestic familiar presents in life should be readily available in death. They can still add energy, help you ground, protect you and help you jump the hedge into the Other. The lack of a physical body presents no barriers that I've experienced; rather, it actually frees them to give you better information as they spend their entirety in the Other now. 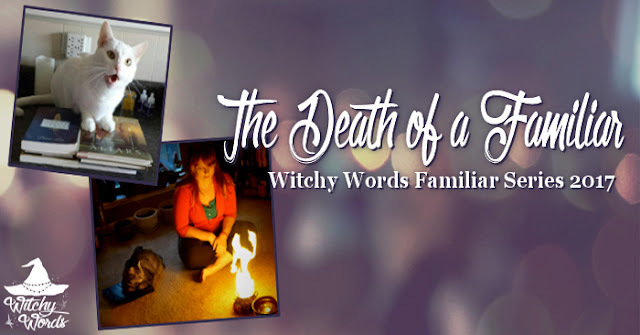 Throughout this article, we've discussed the process of your familiar's death in almost clinical and cold terminology. This does not imply that you won't have emotions about the physical loss of your familiar or that you shouldn't address them. In fact, not facing your grief can create a myriad of issues, ranging from psychological to familiar-related. Initially, because you may not be able to hear, feel or see your familiar's spirit, you will feel the gravity of the situation much deeper than anticipated. That sense of loss will be magnified. I had such different expectations of what would happen after Nyx's death that, when things didn't go as I expected, my heart was ripped from my chest and I felt... hollow. Keep in mind that they are finding their way back to you. Give it time. Breathe. Recognize the loss. Feelings of guilt pervade the loss of a domestic. Sometimes we feel like we could have - should have - done something more to save them, especially when we feel as though we didn't catch the physical ailment fast enough or when finances run out. When we choose euthanasia, even if we recognize that this is the best thing for the animal to save them from suffering and even if we've prepared for the moment it happens, it can feel like we're guilty of killing our beloved familiar. Unfortunately, death comes for us all; it's just a matter of time. Death feels no guilt, shouts no blame. Death simply is. Recognize these feelings of guilt and then let them pass. 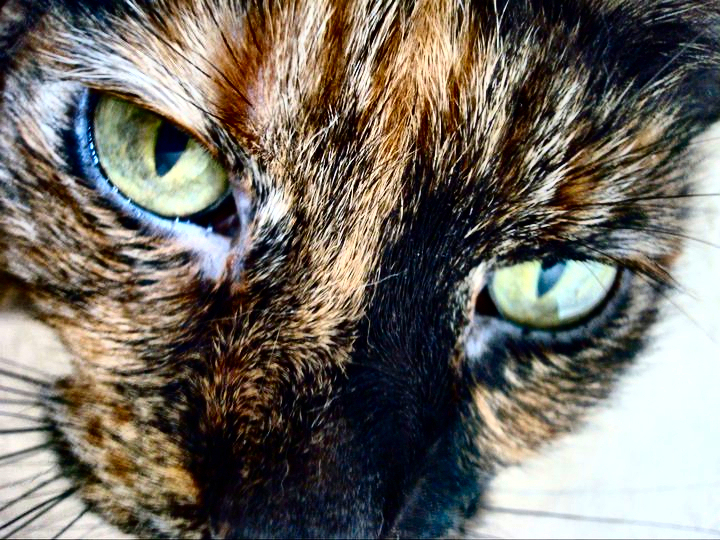 By addressing the key factors of your familiar's passing, you can overcome denial. By working through them via crafting and ritual, you create an outlet for any potential anger. As the feelings swell, recognize them and allow them to pass. Don't fight them but don't wade in them until you drown. Sit with your grief, understand it, feel it and breathe it out. Mourning for your familiar may take weeks or even months. There is no true time limit to how long grief lasts. Even when your familiar's spirit returns, the loss of their physical presence can still feel like a hole in your life. That's okay. There's no reason to feel a sense of guilt or concern that you are grieving even when they're still with you. It's totally normal. That being said, while recognizing our loss and sadness is important, avoid falling into depression, especially if you are prone or diagnosed. Seek needed help if this becomes an issue - if the grief lasts longer than you feel it should, if it continues to interrupt your daily life at school or work, and if it begins to interfere with your personal relationships. If you feel suicidal, seek help immediately; do not wait. Those living in the US who have recently lost a pet can call 1-877-GRIEF-10 to talk with the ASPCA's grief hotline. There is no one right way to deal with your grief. Because everyone experiences loss in different ways, you will need to do what's best for you. Do not let others coax you into feeling like you have to get over the loss of a familiar because it's "just an animal." Familiars are far more than that. The final question you'll need to ask your would-be-familiar as you are pacting is whether your pact ends or continues after death. 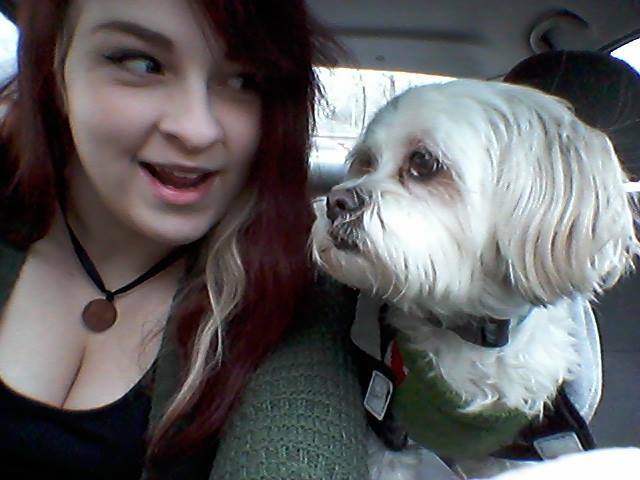 Most, though not all, domestic familiars pact at very least for life. Of course, if your pact isn't working prior to that, you may choose to end it. But if your familiar dies, you will need to know if you will be continuing to work together or if their death signifies the end of the pact. And, if you decide to work together after their death, for how long? Is your pact for the extent of your life? Are there reasons for it to end prior? Next up, on the final installment of this series, we'll be discussing just exactly how you bring about the end of a familiarship pact. Part Seven: Can I Have Multiple Familiars?